Not to you, since you already have a wonderful wife and family — and I’m not the home-wrecking sort, unlike other celebrities I could name. No, I want to marry my partner of five years. That’s why I’m writing. I need your help. Right now, we can’t get married. Unlike movies you may have seen, the obstacle in our case is not a generations-old family feud, nor a mystical curse, nor a war that has torn this great country apart. What stands between us and the altar is bureaucracy. I know you love freedom and hate bureaucracy, so I thought you’d want to know. Some backstory, since we’ve never met. Like you, I come from the film industry. I’m a screenwriter. I wrote Charlie and the Chocolate Factory and Big Fish, along with some other movies you unfortunately didn’t star in. (This can be rectified.) My partner Mike is an MBA. He’s clever. He balances the checkbook. Like you and Maria, we complement each other. Right now, we’re registered domestic partners. California currently has pretty good domestic partnership laws. You signed them, so thanks for that. As Californians, Mike and I have benefits basic human rights that we wouldn’t have in any state other than Massachusetts. We’ve also spent a couple of thousand dollars to draft up wills, trusts and powers-of-attorney to get us a little closer to marriage-equivalence. Do you remember when Britney Spears married that guy in Vegas earlier this year, only to have it quickly annulled? Well, for that day or two, she and whatever-his-name had vastly more rights than Mike or I have ever had. They could file joint taxes. They could adopt children. They could inherit each other’s property. (Probably a better deal for him.) In the eyes of the law, they were more legitimate than Mike and I could ever be. And the Britney coincidences continue: she’s about to have a baby; we just had one. Her new husband, Kevin Federline, was an unwed father; I am an unwed father. That’s the uncomfortable truth, Governor, that has me writing to you today. I’m an unwed father. And I don’t want to be. Sometimes, being unmarried is more troubling. It’s no shock that there are some places in this great country we probably don’t want to travel as a family, and that’s not going to magically change overnight. But even in Los Angeles, everyday life is subtly different for us. To wit: when your kids were little, did you carry copies of their birth certificate in the diaper bag, just in case some overzealous official questioned whether these were “really” your kids? Look, I’m a realist. Letting Mike and I get married won’t suddenly make everything better. There will still be bigots and assholes, and women who cluck their disapproval at the grocery store. However, affirming the right for us to marry would take away one official sanction against gay people. People will still discriminate, but they won’t feel like they have the state backing them up. By the narrowest of margins, the California legislature has just passed AB 849, the Religious Freedom and Civil Marriage Protection Act. It says civil marriage is defined as the union of two people, without specifying gender. Now it’s up to the Governor to decide whether to sign it into law, or veto it. 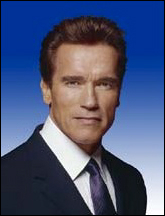 That’s you, Governor Schwarzenegger. And that’s why I’m writing. In your movies, you always play the hero. Do it again. Sign the bill. I know you’re worried about the political implications. Personally, I think you’d get a big boost for standing up for what you believe, damn the conventional wisdom. But in case you need to fall back on your Hollywood career, know that I’m offering to write Terminator 4 for you. Hell, I’ll write Jingle All the Way 2. That’s how important this is. Your spokespeople have said that you prefer to leave the decision up to the courts. I doubt it. You’re a man of action. Take action. Sign the bill and marry me. Governor Vetoes Gay Marriage Bill. Arnold, you broke my heart. But at least you stood up for the current domestic partnership laws, and promised to fight any backsliding.